200 years ago there were no accurate models of human bodies for Doctors to train on. People didn’t leave their bodies to “medical science” so it was difficult to train Doctors and Surgeons. The only bodies Doctors were allowed to dissect for training were the cadavers of those who had received the death penalty for a crime. With an increase in medical schools and less harsher sentencing the Doctors did not have enough cadavers to allow them to train properly so they turned to body snatchers to supply bodies fresh enough to be examined. Body snatching became so common in the late 1700’s and early 1800’s that it was not unusual for relatives and friends of someone who had just died to watch over the body until burial, and then to keep watch over the grave after burial, to stop it being stolen. During 1827 and 1828, some body snatchers changed their tactics from grave-robbing to murder, as they were paid more for very fresh corpses. Their activities resulted in the passage of the Anatomy Act 1832. This allowed unclaimed bodies and those donated by the deceased’s family to be used for study which essentially ended the body snatching trade. Stalybridge was not without its own band of Body Snatchers. Captain Sellars and his band of resurrectionists met in the Pack Horse Inn on Cocker Hill to plan and plot and the graveyard itself was pilfered many times. The following is taken from the book “Reminiscences of a Chief Constable” by William Chadwick. William Chadwick was made Chief Constable of Stalybridge in 1862 and remained there until he retired in 1899. How good a start is that to a story? Love it. After the described meeting in the pub the three proceeded to Mottram Churchyard where they stole a body and placed it in a sack in a hamper and took it to a stable in Stalybridge. Later the following day a carrier’s cart received the hamper and took it on to Manchester. A well organised trade involving most of the graveyards in the area. Another mention of Cocker Hill in William Chadwick’s account concerns a John Chadwick (no relation). John apparently had a strange way of walking and a slight speech impediment causing him to say “Bup a den”. Upon his death he was buried in the Cockerhill Churchyard. The doctors were specially anxious for his body as they thought it was likely to possess some peculiar features. A good sum was offered and the body snatchers went to work in earnest. The men were just lifting the body out of the coffin to put it in a hamper, when the wind, whistling among the tombstones seemed to say “Bup a den”. At this one of the robbers took to his heels, and in his fright jumped over the graveyard wall, rolled down the hill to the river. 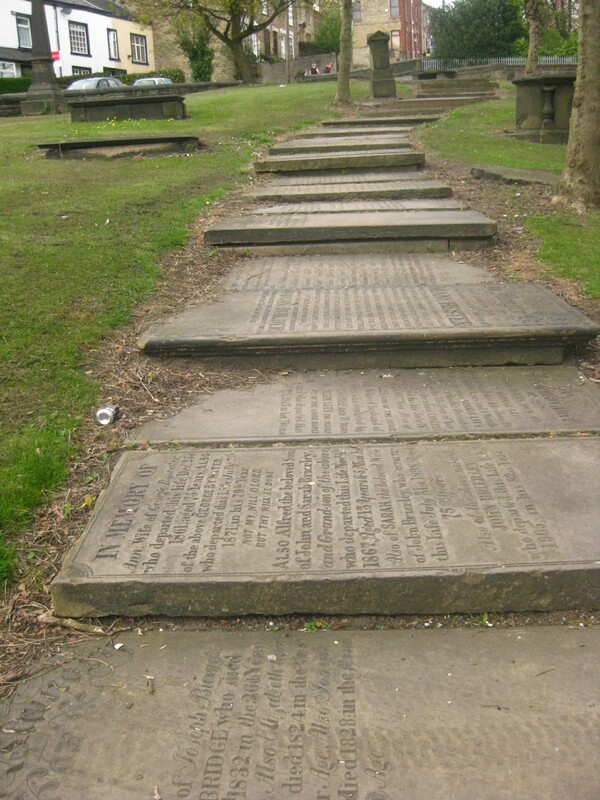 This and other cases caused a further search of the graveyard and it was discovered that the bodies were missing of old Joseph Platt, carrier, Rassbottom Street; old Joseph Hall, clothier, Cocker Hill. Joseph Hall has special significance to me as he could have been one of Joseph Halls who owned Rock Cottage on Cocker Hill many years ago. The Churchwardens at Cocker Hill prohibited the opening of any more graves to check the occupants; however when the graveyard was remodeled in 1972 it was noted that a number of the graves were empty. The photo below shows one of the gravestones still in the Cocker Hill Graveyard with the Caption “This grave not to be re opened”. Whether that stone was first moved by Captain Sellars and his gang or when the graveyard was remodeled I wouldn’t like to say! Cocker Hill Churchyard; Gravestones now used as a path into the town. 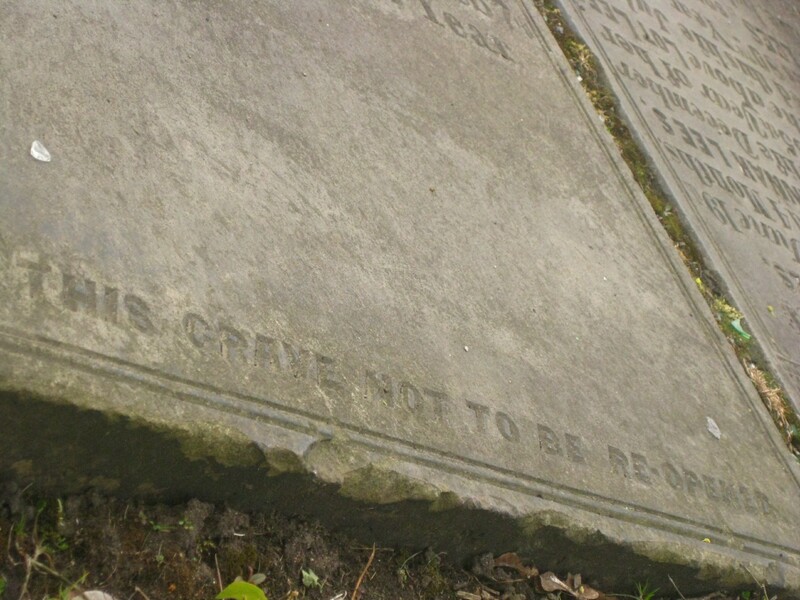 You can find a full list of the burial records for Old St Georges Churchyard together with the gravestone inscriptions on the website for New St Georges Church Stalybridge. Burial records Old St Georges. I loved this poem when I found it; I love that the author, Sam Hill, seems to love the area as much as I do and I love the dialect it is written in. It is thanks to my Grandad that I can understand it all and hearing words like “booside” and “scholars” reminds me so much of him. I find it best to try to read it aloud and then you can get the sense of it even if you struggle with some of the words. 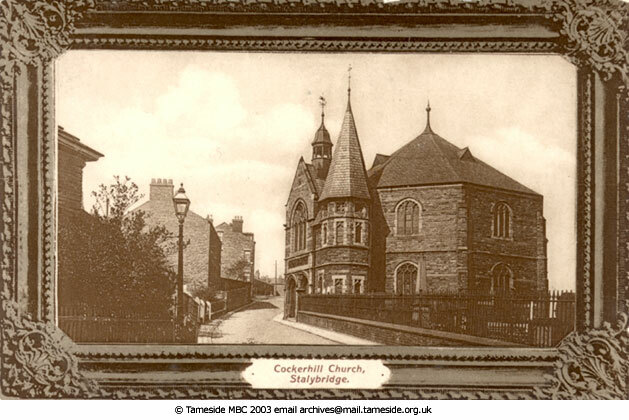 The Church is all gone now, but the Churchyard is still there and you can still “linger and wonder and ponder quite fierce” while looking down on Stalybridge. I often do. Guardin’ the realms of decay. I’ that Little Reawnd Church up o’ th’ Hill. T read th’ owd inscriptions so worn. By that Little Reawnd Church up o’ th’ Hill. Ther’s some on’em rested a while. It’s seldom ther’s bother or strife. Th’ owd mower keeps switchin’ um deawn. Fro’ that little Reawnd Church up o’ th’ Hill. Tell things ‘ut wur wanst on a time. At that little Reawnd Church up o’ th’ Hill.